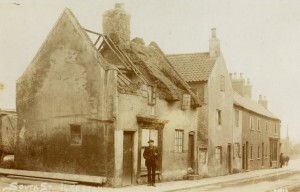 The two thatched cottages were demolished in April 1914. Robey’s – or Robey — Yard was previously known as Skevington’s – or Skeavington’s — Yard, where Christopher Harrison, hosier of Moors Bridge Lane, once had his workshop. He was married to Nanny Skevington, daughter of carpenter Henry and Catherine (nee Matthews) and the aunt of the fowl filchers and milk rustlers Henry and Solomon Skevington. Robey’s greengrocer’s shop was in front with a long flight of stairs over the shop door leading to a dwelling that went over the lower houses. Mrs. Robey was an invalid, a very delicate person. Born in Melbourne, Derbyshire in 1824, greengrocer and fruit dealer John Robey junior was the son of gardener John and Mary (nee Dunnicliff). The family moved to the Nottingham area and by the late 1830’s were living in Basford. John junior married Ilkeston-born Hannah Bower, eldest child of Little Hallam cattle dealer and farmer Gervis (Jarvis or Gervase) and Sarah (nee Bower) at Nottingham in November 1844. And by 1850 the couple were living in Ilkeston when their son John Bower Robey was born. “Run over the b*******” (substitute ‘boggers’?). Thereupon their goods were overturned and ruined, Letitia was struck twice in the face by John causing her nose to bleed, and her bonnet and black dress were damaged in the fracas. At least that was the story told by one party to the argument. John’s account was slightly different. Yes, he had been put out by the usurpation of his pitch and had tried to move the Betts couple along. They had retaliated by insulting his produce calling it ‘rubbish’ and calling him a thief. The husband had threatened him with a 4lb weight while Letitia had got hold of his coat and tried to throttle him. He had not struck her – her nose-bleed was caused accidentally by her own husband – John had simply pushed her away. To the magistrates at the Petty Sessions, even that last act amounted to assault and the greengrocer was fined 5s and costs. In July 1880 John took a late Friday night ride in his pony and cart down to the Bull’s Head Inn in Little Hallam and there got into an argument with young brothers James and William Parks, who lived at Hallam Fields and worked at Stanton Iron Works. The two left the pub but when John followed shortly after he discovered that they had driven off in his cart! The police were alerted and soon discovered the hijacked cart down the Nottingham Road, stationary and with a broken harness. About midnight and further along the same road, at Trowell, one of the brothers was overtaken riding John’s exhausted and beaten pony. The other brother was nowhere to be seen, and nor were a long chain and horse rug, property of John and previously in the cart. and b) that it was all John’s fault anyway because his argumentative nature had provoked them in the first place! When their case reached Heanor Petty Sessions a couple of weeks later the case was dismissed, through insufficiency of evidence. John’s first wife Hannah died at their Robey Yard home in March 1881, aged 52. Having moved from Robey’s Yard into Nottingham Road (number 20), John Robey went missing on Saturday morning, January 6th 1883, and was found two days later in the Erewash Canal at Gallows Inn. He had been married to his second wife for just over a year. She was born Frances Lowe in Cossall, daughter of labourer Richard and Sarah (nee Wheatley) and was the widow of John Hargreaves of Park Road. The couple had gone to bed between 9 and 10 on Friday evening when a less than cheerful John was in poor health, having a very bad cough. He was in low spirits and had been so for about two weeks. ‘Trouble is coming’ he murmured prophetically before retiring to bed. Frances thought he might be referring to the debts he owed and the pressure he felt from this. She had had to give him money — £15 in all — which she had earned from her charring. In the night John complained of back aches and rose about 5am, — earlier than usual — went downstairs, taking the candle with him and shortly thereafter the house door was noisily shut. Fanny called to her husband — ‘Robey? Robey?’ — but there was no answer. She went downstairs to find the candle put out, the door closed but unlocked, and John gone. His purse and 7s 9d lay on the kitchen table. Son John Bower Robey was eventually alerted when his father had failed to meet his granddaughter as he had earlier arranged. When there was no sign of his father by Saturday night son John became more uneasy, … and became even more uneasy when his father’s hat was found in the canal the following day. On Sunday night part of the canal was drained and about one o’clock on the Monday morning John’s body was discovered. At the inquest into John’s death at the Horse and Groom Inn on Tuesday evening, Fanny voiced her disquiet about her husband’s mental state and this was confirmed by Edwin Trueman. The latter had spoken with John a couple of days before his disappearance and found him worried about his debts and an imminent appearance at court; he was in a low state, taciturn and not his usual jovial self. John junior’s death was considered as a ‘possible suicide’ but as there was a lack of direct evidence to support this, the inquest jury returned a verdict of ‘Found drowned’. …. and son John Bower Robey. Their only son, John, helped his father. He married a Miss Fraser. The only child of John and Hannah was John Bower Robey, born in Ilkeston in August 1850. In July 1873 he married Caroline Frazer, the daughter of Bedford clothier William and Jane (nee Lincoln?). John Bower died in July 1889, while then living in Nottingham Road, and in 1892 Caroline remarried to Edwin Ball (his third wife), lace factory foreman, son of South Street lacemaker Thomas and Frances (nee West) and brother of the Ball’s Yard Balls. We rest here to peer into the burial grounds of the old Baptist Chapel and to consider the Baptist Chapels of Ilkeston in general. John Bower Robey’s first cousin once removed was Jane Carline Bower who died and was buried several thousand miles from these burial grounds.